New for 2016 and a Chelsea introduction, this rose commemorates the 150 years of Barnardos. Syrie was Thomas Barnardo's wife. 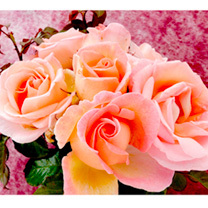 Flowers have a strong sweet perfume with a beautiful colour contrast of pink, apricot and peach. Scent 8. Climber. Flowers June-October. Height 200-250cm. HP - Hardy perennial. Ideal for beds and borders. Scented. Grows well in sun or shade. Perfect for covering unsightly walls.